The aggressive demand for new Class 8 trucks rolled on in September, contributing to record order strength over the past three months, ACT Research Co. reported. North American Class 8 orders in September reached 42,800, according to preliminary data from ACT that it will revise when truck makers make the final information available. The volume is a 90% increase from a year earlier when orders were 22,573, according to ACT. Year-to-date, Class 8 orders have totaled 397,200 units, an average monthly order intake of 44,100 units a month, said Kenny Vieth, ACT’s president and senior analyst. “It is a continuation of this huge order trend that we have been witnessing really starting back last October. But that accelerated after the tax cut in December into 2018,” he told Transport Topics. In the last 12 months Class 8 orders have totaled 503,500 units, Vieth said. In 2006, the all-time record year for production, the industry built 376,000 units. “Orders are one-third above the all-time best production year in history,” he said. On a seasonally adjusted basis, the past three months’ orders represent the three strongest order months in history, for a seasonally adjusted annual rate of 711,000 units, he added. The research firm FTR pegged preliminary orders at 42,300. FTR reported the cumulative orders in the third quarter were the strongest of all time, even when not seasonally adjusted. Four of the top five order months of all time occurred this year, he added. But this extraordinary demand continues to exert strong pressure on suppliers. “You can’t grow at this pace forever,” he said. FTR expects freight growth to slow, but not falter, by the middle of next year. Cancellations for July were about 5,800 and in August were about 7,400, he said. “I am going to say they are moving orders around and I don’t know why,” Ake said. One financial analyst believes orders may slow for the rest of the year, even as production increases in 2019. “Our dealer survey [representing different brands in diverse regions] indicated that monthly order numbers for the remaining three months of the year may be softer than the prior three months,” Mizuho Industrials analyst Kristine Kubacki wrote in a note to investors. “That being said, we expect production, and retail sales, to ramp well into 2019 as dealer inventories remain relatively low and fleet demand remains strong,” she wrote. Meanwhile, the order strength also rolls on as fleets look to fill their trucks with drivers amid increasing driver turnover at large truckload carriers, as well as less-than-truckload fleets, according to American Trucking Associations’ Trucking Activity Report. But the orders keep coming. 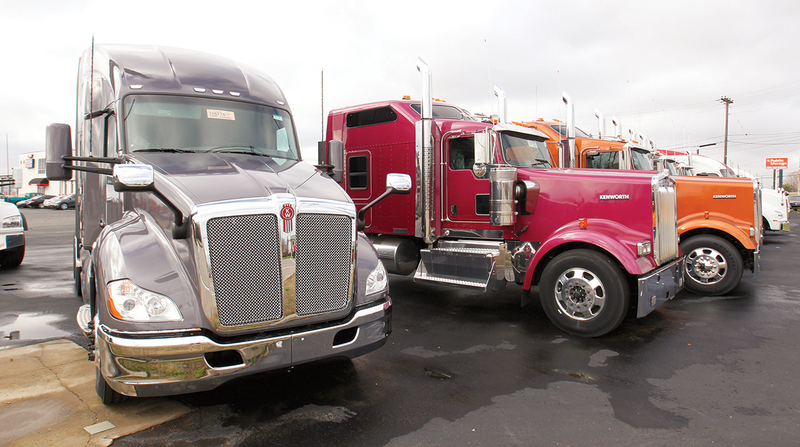 So many good reasons — much better fuel mileage, driver amenities and safety features — that ACT has heard there are already a number of parked and idled older trucks sitting on the sidelines at fleets, Vieth said.